In 1957, Gilbert computerized and changed from a 3-digit numbering system to a 5-digit system. (Volume II of Greenberg's Guide contains a detailed discussion of 5-digit numbering from its inception.) During the transition, the unsold inventory of 3-digit accessories was sold in 5-digit boxes. After that stock ran out, Gilbert continued manufacturing similar or identical accessories. Some items changed little, if at all, in the years that followed. Therefore, it is often impossible to tell whether the accessory you're looking at was originally sold as a 5-digit unit or a 3-digit unit, unless you have the box it came in. 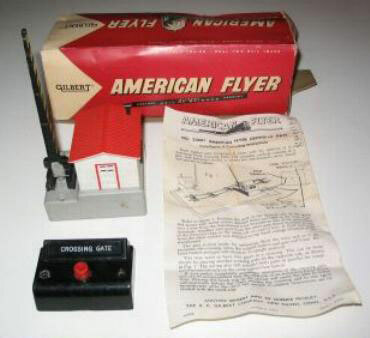 A unique exception is the #23789 Station and Baggage Smasher which had the 5-digit number molded into the plastic underneath. Accessories that had a green base (like the 23589 station) changed from a light green to a darker green base. The font changed on operating buttons and the 5-digit buttons had slots on the side. You need to know what to look for if you want to tell the difference. There are clues, but they are subtle! #23602 Crossing Gate with no roadway made in 1963 & 1964. #23758 Sam the Semaphore Man; the 5-digit version of 758A made in 1957. 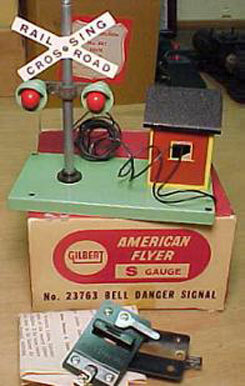 #23759 Bell Danger Signal, the 5-digit version of #759, made in 1957 thru 1960,. It came with one #696 track trip. Because this one has a light green base, it is probably a #759 sold in a 23759 box. 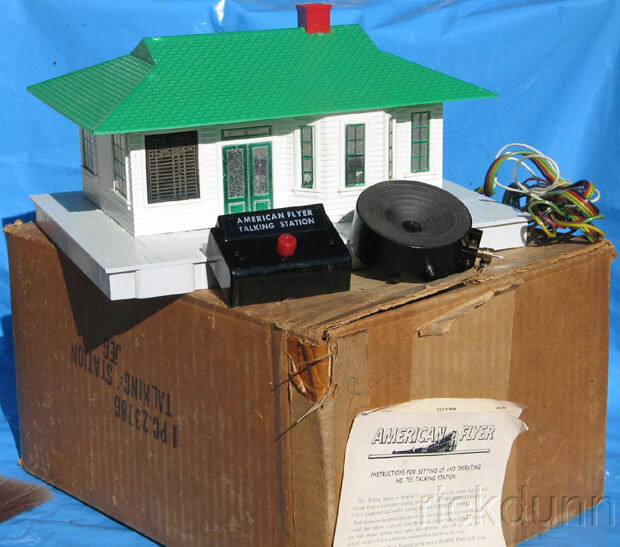 Later units had a dark greeen base. 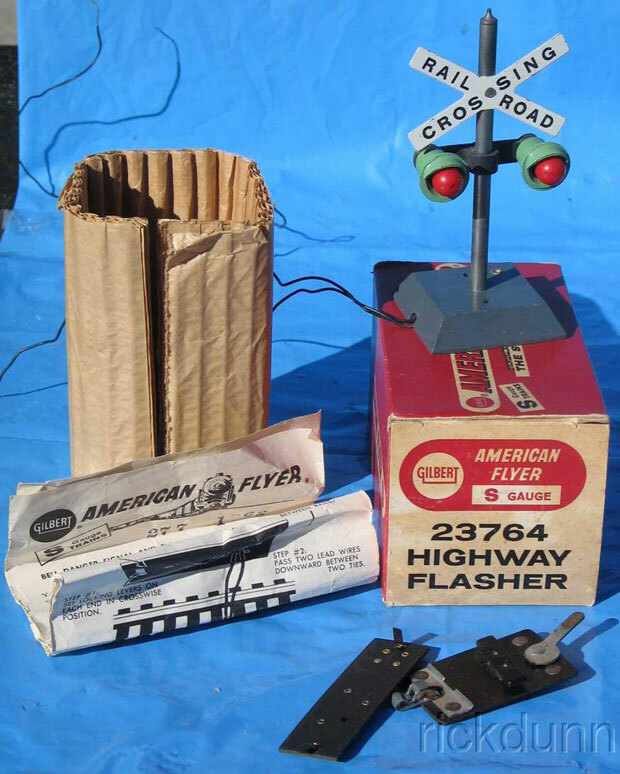 #23760 Highway Flasher, the 5-digit version of #760, made in 1957 thru 1960. 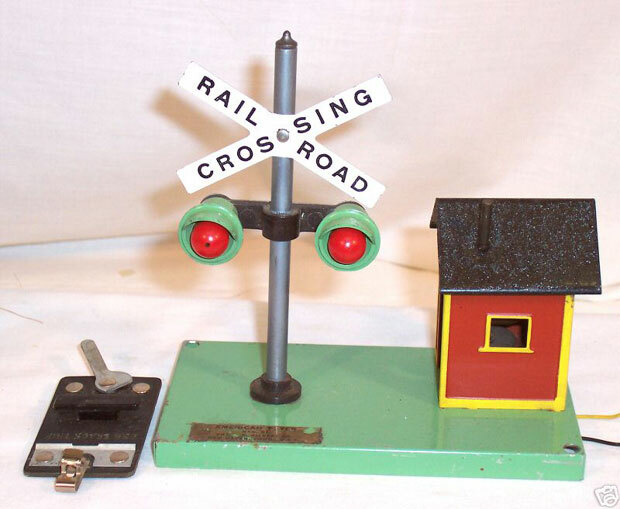 #23761 Semaphore with two button controller; the 5-digit version of #761 made in 1957 thru 1960.
made in 1961 thru 1964. #23764 Flasher Signal made in 1961 thru 1964. It came with with one 696 track trip and one XA16A593 track trip. #23771 Stockyard and Car; the 5-digit version of #K771 made in 1957 thru 1961. #23779 Oil Drum Loader; the 5-digit version of #779, made in 1957 thru 1961. #23785 Coal Loader; the 5-digit version of #785, made in 1957 thru 1960. #23786 Talking Station made in 1957 thru 1959.